This time we have an AMAZING selection of gorgeous NEW products from Prima! If you would like to WIN a few of these products simply peek below for details! Wow!!! Your layout is stunning!! 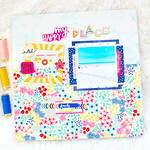 I love all the layering & gorgeous paper you used!!! You are so talented!